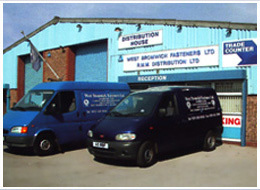 West Bromwich Fasteners Ltd has long established itself as a major supplier of industrial fasteners and tools. Our sister company RMM Distribution Ltd, situated in the same building, specialize in the supply of personal protection equipment, janitorial & hygiene products, and adhesive and sealants. The company hold a certificate of registration with the BSI and operate a Quality management system which complies with the requirements of BS EN ISO 9001: 2008 Certificate No. FS 45331. We are proud members of the British Standards Institute and the Local Chamber of Commerce. The company is situated in the heart of the West Midlands with easy access to the motorway network, operating daily delivery services. Our dedicated and experienced sales team have specialist knowledge of the above products, with further technical advice available from our suppliers when required. We pride ourselves in the extensive range of stock carried, with the ability to produce specials quickly and efficiently. Please allow us to supply you with your next order.